A rich tradition of excellence in the Northeast division. Click here to see our Hall of Fame and read a little about some of our members who have achieved National recognition. The game is played with a bowl which curves as it slows down. Depending on how you hold it during delivery determines which way the bowl curves. The object of the game is to have your bowls closer to the jack (the white object ball) than your opponent when all bowls are played. 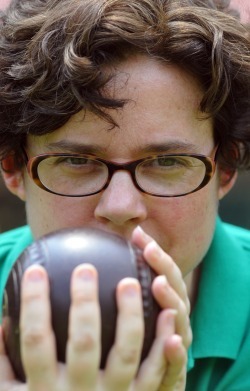 Lawn bowling involves offensive and defensive strategy and no two games are alike. It has the added challenge that the jack or the already played bowls may get moved in the course of play. One point is scored for each of the team's bowls that are closer to the jack than the nearest opponent's bowls. Scoring occurs only after the last bowl comes to rest. Games can be played with teams of one to four members. Since this is a game of finesse and not strength, this is a sport where men and women, young and old can compete equally. A video explanation of the game by some of our friends on the west coast! The video above was created by Charlie Hebert who is an avid bowler and champion with an extreme interest in promoting lawn bowls. Thanks Charlie from your friends in the Northeast! For a downloadable version of the constitution, please click the link below. For the 2015 Policy Manual, please click the link below. A. Name: The controlling body for the game of Lawn Bowls in the Northeast United States shall be known as the Northeast Division, Bowls USA. Hereinafter, it may be referred to as the “Division. i. This organization shall be comprised of a Board of Directors, Officers and, Member Clubs located within the geographic territory defined in the Bowls USA By-Laws. ii. Eligibility for Division membership: A Club must be organized with elected Officers and must play the game of bowls on level greens which they own or on which they are authorized to play. iii. Application for Club membership in the Division must be made in writing to the Division Secretary. The Division Board of Directors must approve any application for Club membership by a majority vote. iv. To maintain good standing within the Division, Member Clubs must pay a membership fee and individual member dues for each active member of the Club to the Division Treasurer each year. The Treasurer, in turn, will forward Club membership lists to the Division Secretary. v. All individual members of Clubs in good standing are automatically granted individual membership within the Division and Bowls USA. vi. Any individual member who belongs to more than one club within the Division must declare a home Club with the home Club paying the individual member dues to the Division and Bowls USA for that member. A. Each Division Member Club should appoint a Club Delegate to advise the Board on all lawn bowling matters impacting the Division. The name of the Club Delegate should be sent to the Division Secretary no less than 45 days prior to the date of the annual Member Club Delegates meeting. B. Meeting Annually a Delegates Meeting will be held at a time and place established by the Board of Directors. The meeting notice and agenda will be sent to each Member Club 30 days prior to the meeting date. Each Division Member Club is entitled to 1 vote at the Delegate’s Annual Meeting. At this meeting, the Delegates receive reports from Division officers about the affairs of the Division; elect Officers and Board members for the Division; and consider proposals for amending the Constitution. A. Board of Directors The Division is governed by a Board of Directors of 7 to 12 members. The Board includes a President, Secretary. Treasurer and 4 to 9 Directors. Please Note: The Division President votes on Board matters ONLY where needed to resolve voting deadlocks. All Board members and Officers are recommended by the Nominating Committee and are elected at the Delegates meeting for a term of one year, except the President who is elected for a term of two years. In addition, nominations can be made from the floor at the annual Delegates Meeting. All newly elected Officers and Board members take office on the Monday following the completion of the Annual Division Open Tournament. All living Past Presidents are ex officio non-voting members of the Board. To the fullest extent possible under governing laws, Board members shall not be held liable for monetary damages due to the Board’s action or failure to take action. B. Powers The Board of Directors has general charge of Division affairs, except for elections and amending the Constitution. It meets at the call of the President. It may fill any vacancy on the Board until the next election. The Board annually appoints 2 Division members to represent the Division on the Bowls USA Council. The President is an ex officio member of all Division Committees. At Board meetings, a majority of the voting membership present constitutes a quorum. A voting Board member may give their proxy vote to another member, as circumstances warrant. Except where superseded by this Constitution, Robert’s Rules of Order shall apply to all meetings. A. President The President has general administrative powers; sees that Board directives are implemented; plans and presides at the meetings of Delegates and the Board. The President shall appoint all Committees as well as Committee Chairs, as warranted. The President can call meetings, as required, and is authorized to transact the financial matters of the Division in the Treasurer’s absence. B. Secretary The Secretary takes the minutes at meetings; maintains the minutes, papers, and correspondence of the Division; and sends notices and Tournament schedule to Member Clubs. In the absence of the President, the Secretary shall assume all duties and responsibilities of the President. C. Treasurer The Treasurer keeps an account of Division revenues and expenditures; pays Division bills and, maintains accounts according to Board policy. The Board establishes dues amounts as necessary. The fiscal year of the Division is January 1 through December 31. This Constitution may be amended by a majority vote of the Delegates at the annual Delegates Meeting. All proposed Constitutional amendments must be submitted to writing to the Secretary 60 days before the meeting, and must be distributed to the Member Clubs 30 days before the meeting.